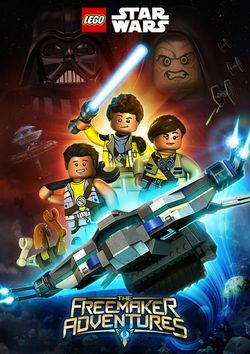 LEGO Star Wars: The Freemaker Adventures is an original Star Wars animated series released in 2016. Two sets are also be based on this series- 75145 Eclipse Fighter and 75147 Star Scavenger. The series revolves around the Freemakers, a family of scavengers. "The Lost Treasure of Cloud City"
"The Kyber Saber Crystal Chase"
"Return of the Kyber Saber"
"The Tower of Alistan Nor"
"The Lost Crystals of Qalydon"
"The Pit and the Pinnacle"
"Return of the Return of the Jedi"
Facts about "LEGO Star Wars: The Freemaker Adventures"
This page was last edited on 17 October 2017, at 22:22.